I have had KOTOR on the game shelf for a long time but never really got into it until recently. I figure since SWGOH is drawing off that content and everybody is so loopy about it, then I'll give it another go. I have to say, the dialogue options between Bastila and the player are pretty forced, like they are trying to shoehorn a love story into the middle of the adventure. Am I only one who thinks the dialogue is cringe-inducing? I've just been skipping the shmoopy-talk. Of course, this probably explains why so many SWGOH players were complaining that Bastila didn't look the same as the KOTOR character that they fell in love with when they were kids. I definitely agree, but I think they felt like they had to force it because they weren't sure exactly how to introduce them. Bastila was an opinionated and holier-than-thou Jedi, which was a good character for her, but didn't really leave her open to the Revan character, who could go in any direction AND none of these directions really seemed interested in any kind of relationship. I feel like with Revan being a very well written character outside of the game (the storyline of who he is and what he does), the options for the in-game dialogue and your actions there weren't given the attention or depth he deserved, because he would be following the main storyline. This is mostly fixed in KotOR II where the conversations are expanded and have better depth (once unlocked, that is), though the game is not without its flaws. Have you talked with HK47 yet? He's one of the tougher companions to get, but well worth it just for the writing in the conversations you have with him. I've played through the entire game too many times to count, HK's pacifist package provides the best dialogue in the game, I love it. This trend is definitely continued in KotOR II, where his pacifist package gives the funniest conversations you'll ever have in (probably) the Star Wars universe. Unfortunately these really only serve to make the player laugh and to reveal more about the PC's (Revan) backstory. They do not add depth to him, nor shape his character into what we're told he is. Yeah, I've got HK going, awfully bloodthirsty for a robot. I don't quite get what he is all about yet. Fumbling around the fish planet right now. Could not find a clear direction so trying to beat the swoop record. The fish world (Manaan) is my least favourite of all of them, but luckily it gets better near the end. Some of the puzzles along the way are really annoying though. There are guides online if you get stuck (and after multiple playthroughs over the years, I still get stuck on a few of them). HK's bloodthirst makes a bit more sense later. I don't think the dialogue is that bad - I mean the romance between Bastilla and the player is better than the dialogue between Anakin and Padme (not that would be hard to beat anyway). Also remember this was the first game of this type as well - these games have moved a long way since, such as Mass Effect trilogy etc. If you are on Manaan (the fish planet) there is a cheat to double your inventory. Take 2 team mates with you to the underwater substation (when you get to that point) but first load them up with the most best or expensive gear. Before you exit the station in a pressurized suite - remove all items from your team mate. Once you load outside, go back in - all the items removed will be in your inventory, as well as being magicaly back on your team mates! Repeat as many times as you like. You can get the best Jedi Robes for all players, best lightsabers, crystals, named and upgradable armour and weapons etc etc - useful trick. Most of the dialogue is good. It's just the love story prompts I am not into. It seems completely out of place. This nobody noob (the player) shows up and it's love at first sight for the "veteran" Jedi who helped take down Revan with her Battle Meditation? Please. It's going to take a lot more than that. You will get a chance to get rid of bastilla eventually. I agree, she is a horribly cheesy character. I don't think she is cheesy. SHe is a little girl (like Anakin) was probably separated from her parents at too old of an age - she still has fond memories of her father and mother issues. Her power in Battle Meditation (like Anakin's raw force ability) made her an asset to the order where she was "held back" I mean crikey - she is still a padawan! I only realized that the second time I played the game - I thought she would at least be Jedi Knight, especially after the defeat of Revan, but no. She clearly has some rebellious streak in her and has never known love (after being ripped from her loving father/family) she acts out in regard to the bond she shares with the player - she is also deeply attracted to the player for likely many reasons - and they are forced to be in close proximity with one another where people can grow on you. She has never been "hit on" before - and is quite self-conscious, nervous and resistingly intrigued by it all - she is quite awkward indeed, but understandably so. Again the love story in KOTOR is much better than that of AOTC by a long shot. You also aren't obliged to romance anyone either, if it feels awkward to you. I don't think I even tried until I had a few playthroughs under my belt. Bastila's and Carth's guarded nature makes more sense later on as well. However it is more of the "cannon" story to woo Bastilla, so keep it up @EventineElessedil ! I actually think the dialogue when you can call her a "Kinrath pup" to be quite amusing. That is pretty much just standard Bioware. They always include romance options in their games and they are always kinda cringe worthy. Shame you don't get the kind of bedroom scenes from Mass Effect in KOTOR - be cool to see a half naked Bastilla, lol, they would need to improve the graphics though. 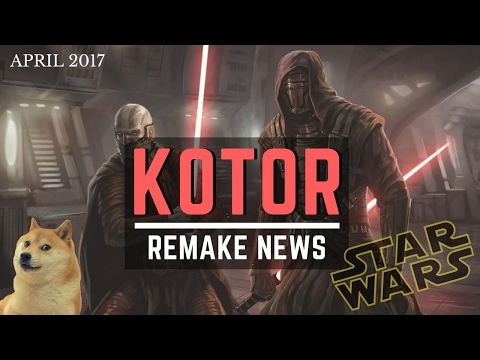 By the way I heard a group of gamer programmers are re-doing KOTOR. I heard a large group of people did the same thing with Elder Scrolls Oblivion - gave it Skyrim graphics and gave the game a complete re-haul. I heard the same thing about the X-Wing space flight simulator game (TIE Fighter too), but nothing has ever come of it. I would love to replay those games with modern graphics. They were the bomb. That is because these projects always get started without the approval of the company that owns the game and end up getting slapped with a cease and desist. Not sure why so many people start working on projects they have to know will never be allowed to see the light of day. Its only if those refurbished projects want monetary compensation. If they do it as fans and for free to whoever wants it, its usually not a big problem. The main issue is that it tends to be a bigger task than people thought, not getting paid to do it, the project runs out of steam and dies. Well here we go I guess - you called it! It seems such nonsense - obviously there is a market for people wanting a remake or re-release of the game, so why not do it themselves. Others start the task then get shut down - if there is money to be had, why not Lucasfilm do it. Legally, though, it's not nonsense. You must vigorously defend your copyrights and trademarks as a business. If you start cherry-picking who can get away with it, you open yourself up to losing them via precedent. 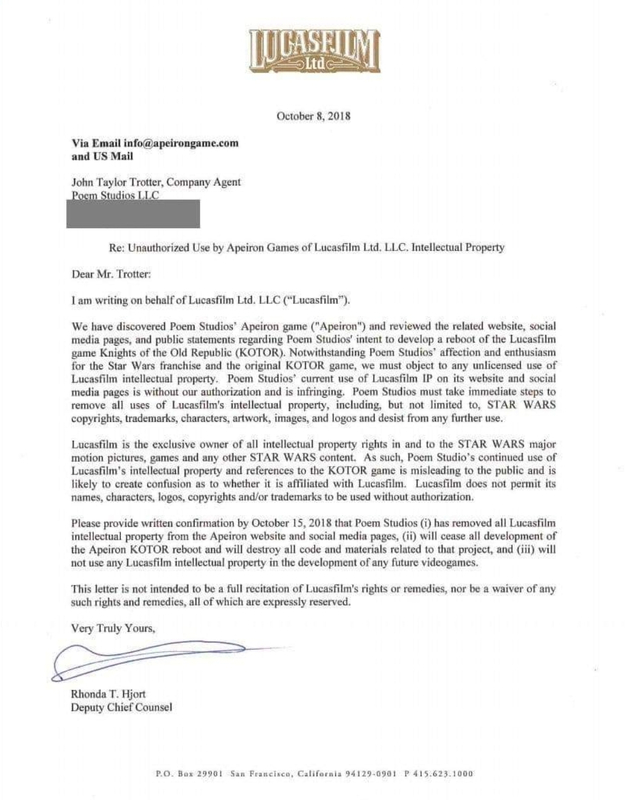 Now Lucasarts could have still have talks with Apeiron about a joint project or licensing, but they can't just allow people to use their IP and run with it. And this is coming from someone that really, really wants a Tie Fighter remake, who also knows that Lucasarts will never do it (market is too small). I totally agree - I work in law and did dabble in IP law once upon a time. I just think its crazy that obviously there is money to be made by Lucasfilm if they tuned up the KOTOR games like this - so why not do it themselves? I think our definition of "money to be made" is a lot different than the game publishers. Single player games are on the decline, in favour of "micro" transaction games and loot boxes (though I love that they took lots of heat on this). As a gamer, this is a real shame. There are a lot of game experiences that simply don't translate to a multiplayer, DLC purchase type of game. The best thing to happen to the star wars franchise in the gaming space would be if it was licensed to more publishers, especially smaller ones. This "exclusive rights" thing isn't doing it for me. The only reason why single player games are being pushed aside, and micro transactions and loot boxes are on the rise has to do with people paying for things. Impatience is killing a once great industry. Personally, I want games to be offline and single player, can't stand multiplayer and really can't stand paying to unlock things early. It takes the achievement out of the achievement of unlocking and I think that is cheating. It ruins the gaming experience for those who will not or cannot afford to spend money.